The twelve promises of Jesus were given to Sister Margaret Mary. Jesus said to Sister Margaret Mary, "Look at this Heart which has loved men so much, and yet men do not want to love Me in return. Through you My divine Heart wishes to spread its love everywhere on earth." Which promise is most important to you? I will comfort them in all their sorrows. I will be their refuge during life and at the hour of their death. I will bless all their undertakings. Sinners shall find in My Heart the source of infinite mercy. Lukewarm souls shall grow closer to Me. Eager souls shall quickly rise to great perfection. Those who promote this devotion shall have their names permanently written in My Heart. The all-powerful love of My Heart will grant to all those who shall receive Communion on the First Friday of nine consecutive months the grace of final repentance; they shall not die under my displeasure, nor without receiving their Sacraments; My heart shall be their safe refuge at that last hour. 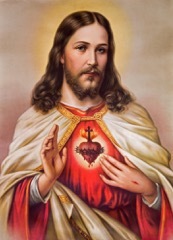 Jesus gave this humble Sister the task of making known the riches of His Sacred Heart, so that we would come to Him as a source of forgiveness and love. Don't assume bad things can't happen to you or your family. That is not how life works. And it is why we need the Devotion to the Sacred Heart of Jesus. 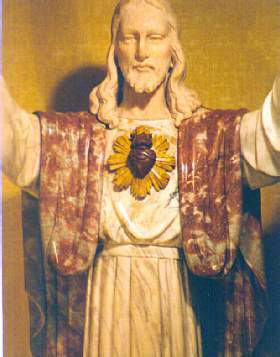 Honor the Sacred Heart of Jesus and in wonderful ways He will make your life so much better. and by having a picture of the Sacred Heart in your home.